I have been making gluten free pasta for a few years now. I believe now my recipe is stream lined and will be easier for you to make. I will say, that in the beginning it will require some patience from you. 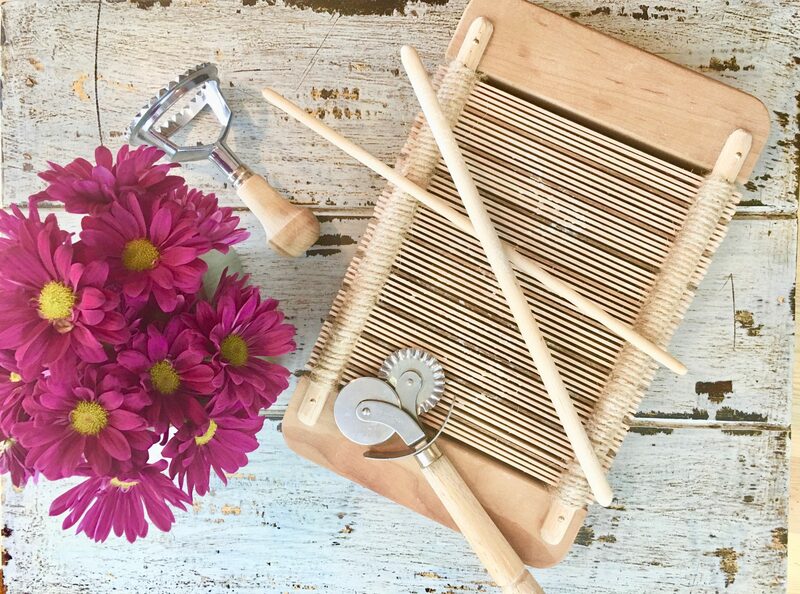 Making pasta on a wood board, or you can make in your KitchenAid mixer. Simple ingredients Cup 4 Cup Gluten Free Flour, xanthin gum, eggs and a little water. The recipe for this dough is best divided into 4 equal portions for rolling and shaping. Gluten Free dough is not as soft and pliable as regular past dough. After you flatten out with your hands you can even take a rolling pin to flatten before running through the pasta roller. The first roll through could look like this, do not panic giver a light little dusting and roll through again at the widest setting on the pasta roller. Your dough can even look like this the first roll through. Do not panic, keep it like this and pat it together (do not ball it up) and run it through the widest setting again. See how the dough continues to smooth out. Gluten Free Pasta that you can make tortellini, ravioli, corzetti, fettuccine, lasagna, angel hair & cannelloni . Mound the flours on your counter top, sprinkle your salt, make a well in the center, add your egg and olive oil. Or add these ingredients in the same order in the bowl of your kitchen aide mixer. Using a fork start whisking the egg and oil and start incorporating flour into the center. Now you just have to get your hands dirty and start working the dough. If the dough is coming together but there is still a bit of flour on the board sprinkle 1 tablespoon of water on the flour and work into the dough. Use water as needed. Once the dough ball is formed wrap it in plastic wrap and let rest for 20 to 30 minutes before you begin to roll. Divide the dough into 4 equal pieces. Take one piece and keep the rest of the dough covered. Take the first roll through on the widest setting. It may look like a shaggy mess.Don’t panic, start patting and folding. It almost feels like working with pie crust. Roll through the widest setting again. And again…. keep fold and running through the widest setting until you notice the dough smoothing out and coming together. After your dough becomes smoother then you can start running through your machines adjustment settings to thin out the pasta. Use a light dusting of flour as necessary for this process. This dough dries out quickly, so you want to make sure the dough you are not working with is covered. You do not want to wait to long before cutting. Once the pasta is cut place it in a bowl or sheet pan, cover with plastic wrap and refrigerate until you are ready to cook it. The pasta is delicate, you do not want to leave it out uncovered. Pasta tools & ingredients used in this recipe in affiliate with Amazon.